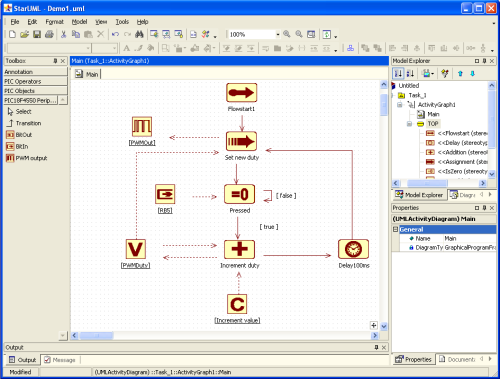 This project is a plugin for the popular Open Source UML/MDA Platform StarUML . 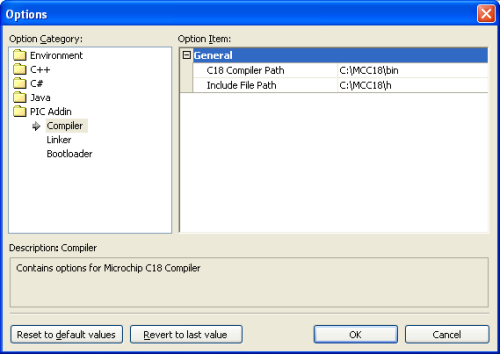 The plugin extends StarUML with some new UML elements for modelling, compiling and downloading an application (via USB) to the microcontroller PIC 18F4550. This project does not comprise full modelling capabilities for all peripherials of the PIC but shall serve as inspiration and/or basis for your own extensions. 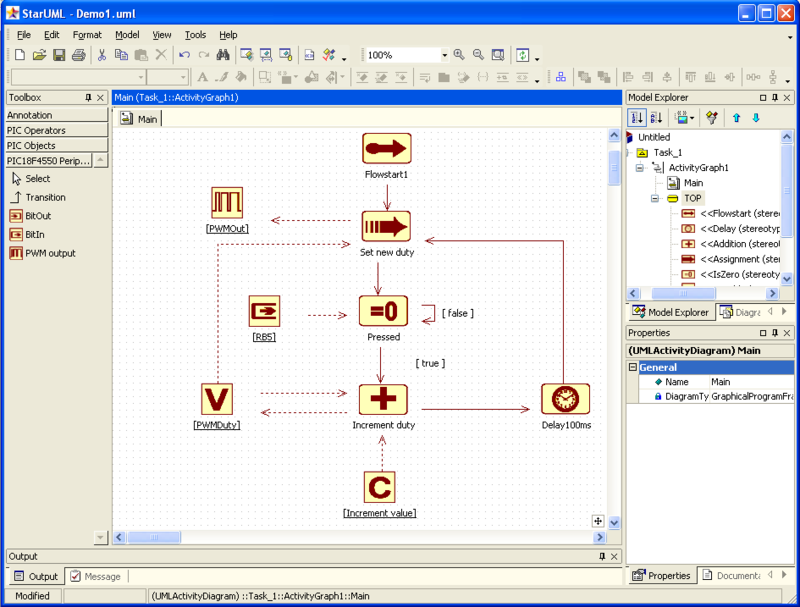 The following picture shows a screenshot of StarUML with a small application model that creates a changing PWM signal. 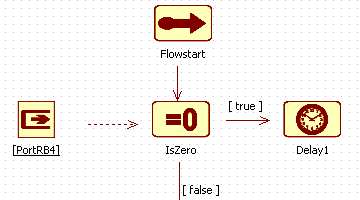 Dashed lines show the object flow (the usage of objects by the activities as input or output) while solid lines are used for modelling the program flow, e.g. the transition between different activities. Now you need to make the plugin accessible to StarUML as a COM object. Therefore you need to execute the batch file "register.bat". Note: The Assembly Registration Tool "regasm.exe" must be in your search path for the batch file to work properly. It comes with the .NET framework and should be lokated in "C:\WINDOWS\Microsoft.NET\Framework\v2.0.50727", for example. Now the VisualPIC AddIn is ready for action. 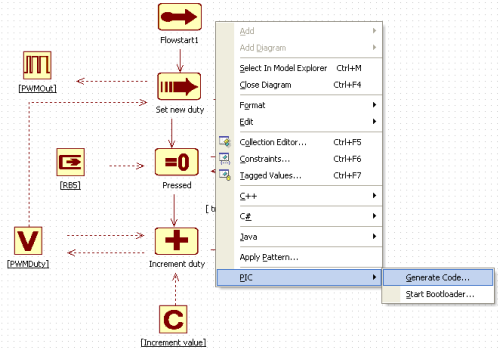 Objects like Delay or BitIn/Out offer tagged values for modeling specific properties. » After a UML model of the desired functionality has been created it is required to configure the plugin parameters, so that the code generator and compiler can do their job. This is done in the configuration dialog available via menu "Tools/Options...". Bootloader Start bootloader after build has finished If checked, the bootloader starts after successful code generation and compilation. Bootloader Download application automatically If checked, the download is done by the bootloader automatically as soon as a PIC running in bootload mode is detected at a USB port.